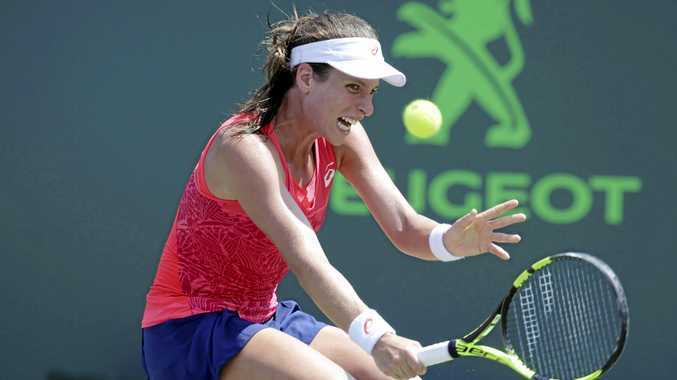 TENNIS: Sydney-born Johanna Konta has become the first British woman to win the Miami Open. Konta, 25, defeated former world No.1 Caroline Wozniacki 6-4 6-3 to also become the first woman from her country to win a WTA Premier Mandatory event. The straight- sets win took Konta to a career-high world ranking of seven, beating her previous best of ninth last year. It was a first final in Miami for both women with the Dane looking to win her first title in 2017. Konta had already taken out the Sydney International in January. The Brit took an early 2-0 lead but Wozniacki, after a brief chat with her father and coach, fought back to level at 2-2. Konta broke again but after games went with serve, Wozniacki again levelled at 4-4. Immediately, though, the Dane lost her serve again and Konta was able to hold to win the first set. A break in the first game of the second set gave Konta the advantage but she was unable to capitalise with Wozniacki taking the next two games for a 2-1 lead. The 26-year-old Dane received attention and had her right foot and ankle strapped but played on and took a 3-2 lead. From there, though, Konta took control to win the next four games to take the title.